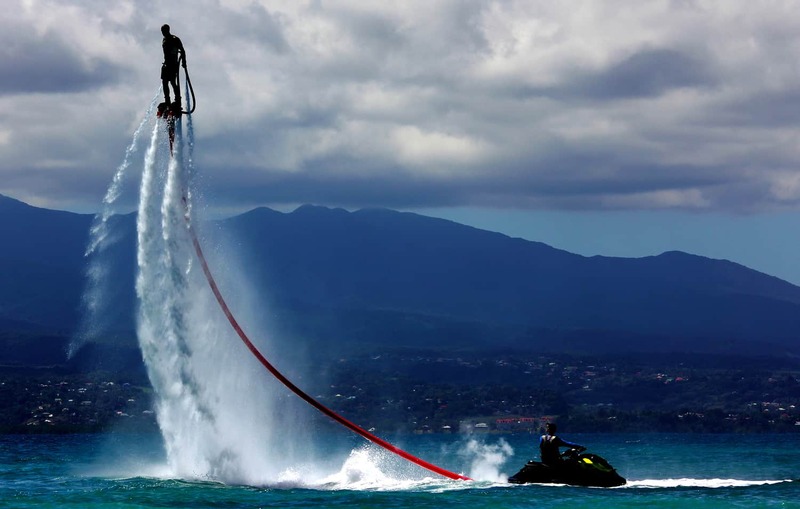 Defy gravity from over 5-metres up and step into Iron Man’s shoes with Flyboarding and Hoverboarding. Two new futuristic activities invented by the exceptional Franky Zapata. 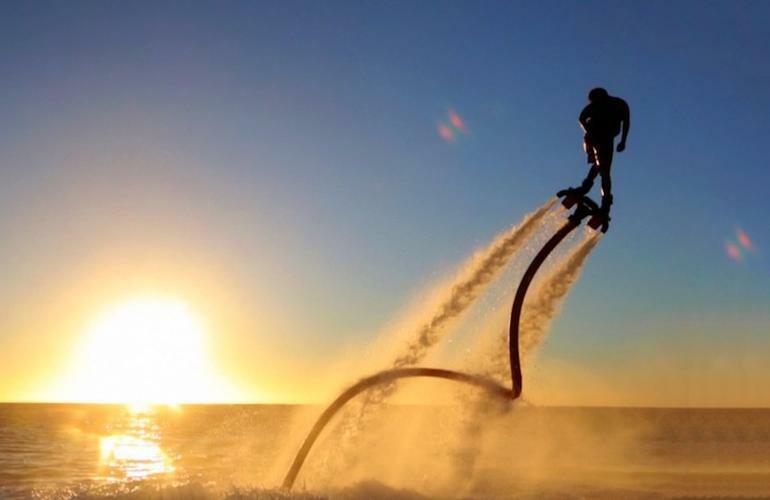 Before tracking down some of the best spots in the world, it’s probably best that you ask yourself this question: What exactly is Flyboarding all about? Basically, it is a platform attached to boots that are connected to the turbine of a jet ski which rises in the air allowing you to perform different freestyle tricks. Soar to heights of up to 12 metres and some pros even go up to 20m! During the Flyboard session, the instructor stays on the jet ski to control the engine throttle and regulate your power and height. 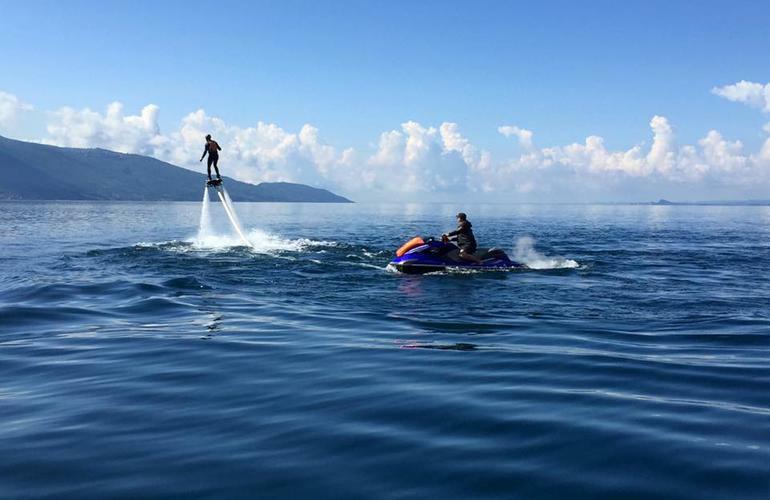 From the moment you find a big body of water, whether a lake or an ocean, you can practice Flyboard and Hoverboard. Our selection is based on the quality of service and the reputation of the school, while also focusing on the exceptional panoramic which will surround you. Read on to discover our choice of essential destinations to try out the Flyboard in ideal conditions. What’s a better sensation than flying in the air while feeling like Icarus (before he reached the sun)? In recent years, Franky Zapata has made our wildest dreams come true, by inventing machines even crazier than the last. If you are visiting Altea, Benidorm or Alicante, don’t miss the opportunity to test out one of these awe-inspiring machines. We assure you that you’ll feel light as air and have a smile comparable to the Cheshire cat! Thanks to the best instructors, quickly learn all the basic tips to help you keep control of your board and intoxicate yourself with a shoot of adrenaline. Franky Zapata’s brilliant invention is also available in Belgium. You can test the Flyboard on the lakes of L’Eau d’Heure in the municipalities of Cerfontaine and Froidchapelle, located in the provinces of Namur and Hainaut. 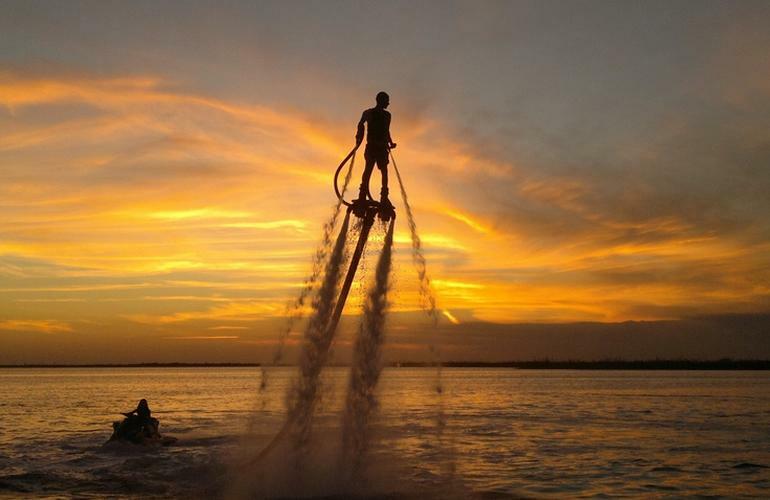 The Flyboard is based on a clever system that can propel you either in the air or under water. The pressure required for propulsion is provided by the jet-ski turbine and then released by the board via a flexible hose. When it comes to handling the board, it actually comes quite intuitively, which means you feel in control relatively quickly and after a few minutes you are already defying the laws of gravity just like your favourite superhero. 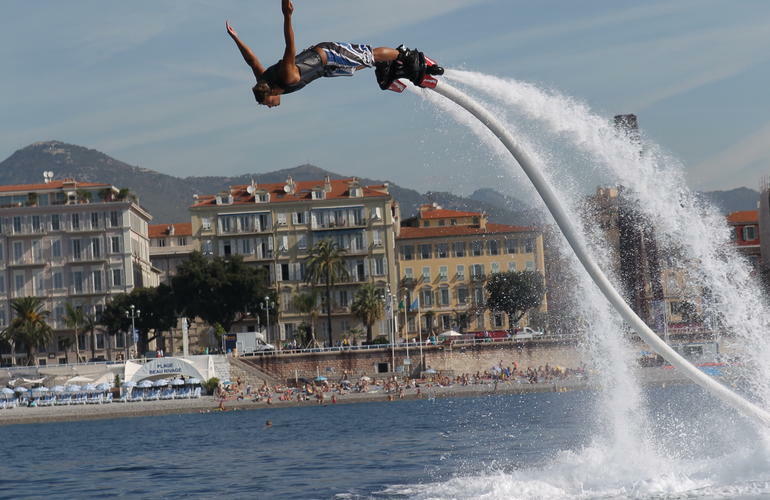 On Pointe Rouge beach, one of the most popular in the region, take to the air and practice the Flyboard, feel the wind in your hair while you fly over the water and enjoy a magnificent view of the bay of Marseille. It’s not hard to find reasons to practice the Flyboard on the spots of the PACA region, what with its turquoise waters and relentless sun, not to mention the water temperature which is between 18 and 28 ° C in summer. Soar with ease and with a magnificent view of the coast of Bouches-du-Rhône, also called the Blue Coast. With the help of your instructor, learn to fly in the iconic blue waters of Santorini, powered by the powerful turbines of the Flyboard. Santorini is one of the Cycladic islands located in the Aegean Sea in Greece and it is the largest and most populated island of this volcanic archipelago. 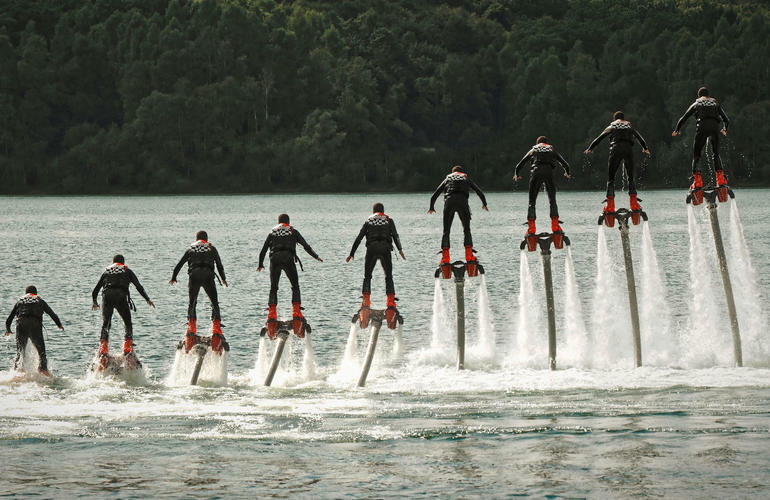 As you may have guessed Flyboarding requires a lot of balance to stay up, but after a few minutes of training you’ll already feel like the master of this crazy invention. Furthermore, if you find yourself a natural in the air, then why not try and perform a few freestyle tricks on this revolutionary machine. Master the element of air and fly over the beautiful peninsula of Sainte-Anne in Martinique. 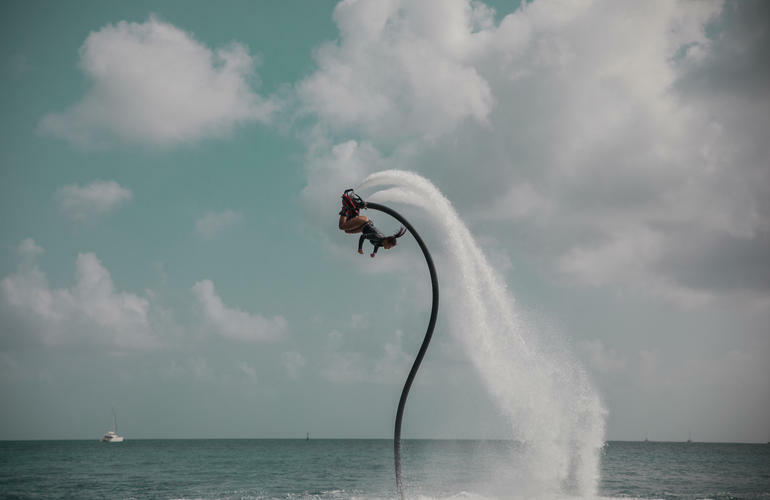 Head to the seaman’s beach for an epic Flyboard session and discover the wonders of the Caribbean Sea as if through the eyes of a bird and bring home memories you’ll be talking about for years! 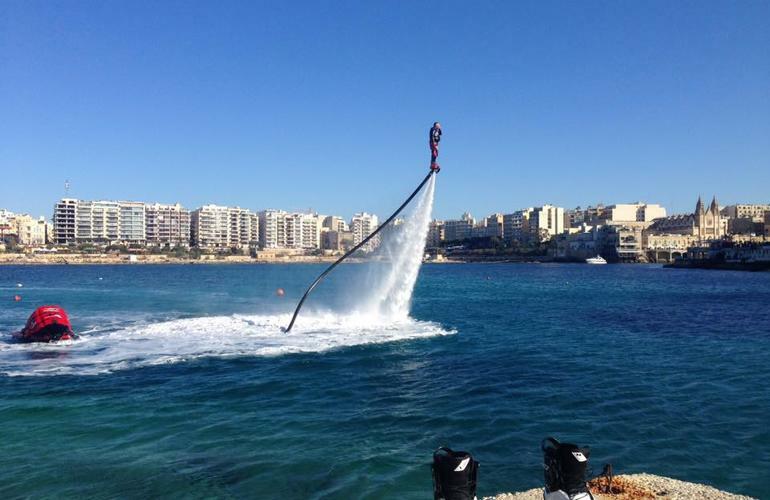 Another dream destination where you can practice the Flyboard and enjoy a breath-taking view in Birkirkara on the Island of Malta. Franky Zapata invention is now available almost everywhere in the world, even the island state of Europe lost in the middle of the Mediterranean! Located 93-kilometres south of Sicily, it consists of an archipelago of eight islands, only four inhabited, and it is in the city of Birkirkara that we can test this water-powered activity and get a nice dose of thrills. Head to the Balearic Islands to the city of Palma Mallorca to discover this unusual activity in a dream setting. 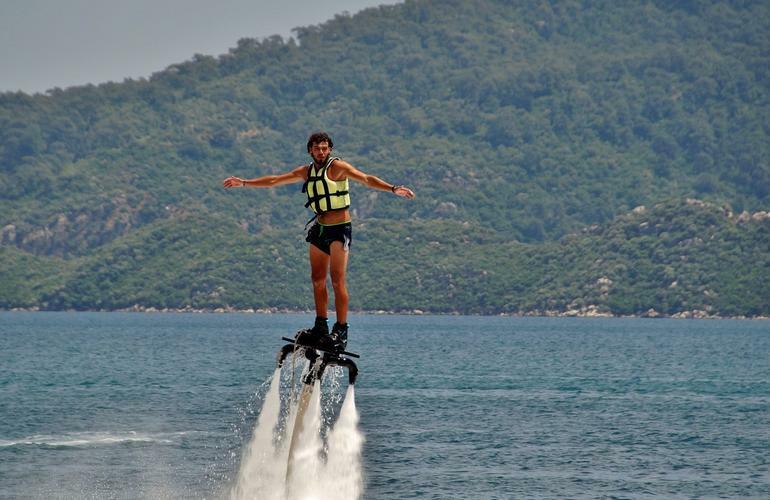 Enjoy the view and zoom through the skies on your Flyboard, and quickly realise that this Spanish island has everything you need to make this moment unforgettable and provide you with an adrenaline boost. Lake Garda is located in northern Italy, near the cities of Brescia, Verona and Trento. The northern part of the lake is narrower and surrounded by steep rocky cliffs, while the southern part is larger and framed with beautiful flat beaches. This lake, which is the largest in Italy, is a true haven for water sports, boasting its blue waters and rugged green mountains as a panorama. Although canyoning, Via Ferrata or rafting is very popular in this region, it’s also the ideal place to practice Flyboarding, Hoverboarding or any other gear with hydro-propelled levitation. We are now heading to East Africa to the beautiful region of Zanzibar. The island of Tanzania is known for its long white-sand beaches lined with palm trees and coconut palms, but it’s also a place where you can enjoy the joys of water sports such as Flyboarding. 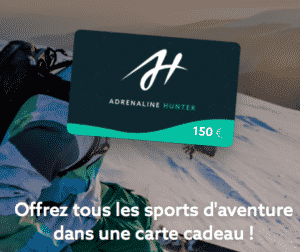 Become the rules of the air thanks to this new and fun activity which is rich in adrenaline. The thrusters allow you to move under the water like a dolphin and then launch you out of the water like Superman or Aquaman. A few bonuses of Flyboarding is that it requires no previous experience, it’s easy to learn and there is hardly any theory. In fact, 95% of those who have tried this sport started flying in no time and have all had an unforgettable trip. Book a Flyboard course with Adrenaline Hunter. Famous all over the world for his fantastic inventions, Franky Zapata has earned a reputation as a visionary after his creation in 2011 of the Flyboard, a nautical jet pack connected to a jet-ski which allows the user to be propelled severa; metres skyward. However, it’s the Flyboard Air, a Hoverboard equipped with six turbines and poweredto reach a speed of 150km/h, which has put another notch in the legendary Zapata’s belt. The Marseillais dazzles us each time with his overflowing imagination, incredible performances on his inventions and the desire to bring to life all our wildest dreams. Check out this short presentation of the Flyboard Air, because unlike before, this time there is no cable attached to the craft. For now, this crazy invention of Franky Zapata is for his use only and it will take a little more time before the public are able to take classes on this futuristic racing car.